ExactLogic products are logically designed to be exactly what you need. With a focus on energy savings, we can provide you with the exact application you need for every project. Ease of installation, competitive pricing and intuitive operation provide you incomparable value. BACnet Evaluation Kit Exclusively for new customers! This provides an opportunity to evaluate the product for a small investment. Explore its functionality on the display stand model and install the other on an existing BACnet system to see how smoothly it will integrate. BACnet Thermostat The product that started it all. Our extensive line of BACnet-compatible thermostats meets the vast majority of HVAC applications. From a stand-alone fan coil application to controlling a large network of heat pumps, it is an extremely versatile product. Superior reliability and competitive pricing will help you win projects and retain satisfied customers. BTU and hot/cold water pulse monitoring thermostats. Interface From a multiplex card that will reduce the need for system inputs, to an interface that can measure voltages, convert input signals and provide compatible outputs, ExactLogic interfaces offer a multitude of solutions. Sensor This stainless steel plate sensor can be remotely mounted from any of the ExactLogic room thermostats. Perfect for school applications and public areas, it provides the tamper-proof solution so commonly requested. The indoor ambient light sensor is compatible with all energy management systems and measure the indoor ambient light levels extremely accurately. Field calibratable, too! 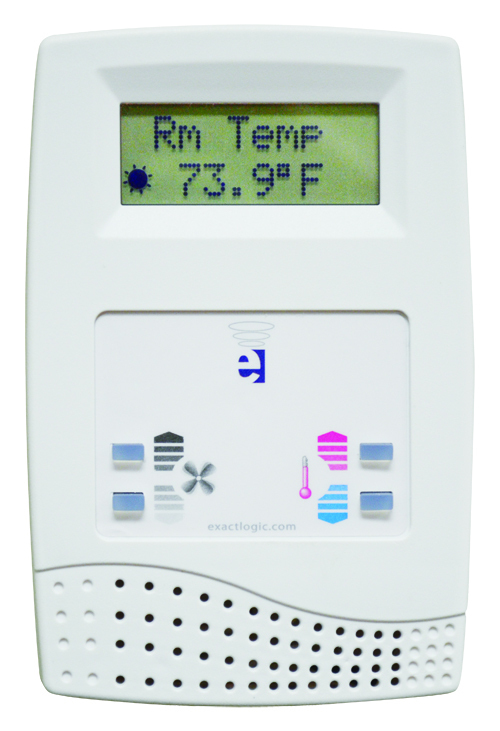 Thermostat Options Add-on options include; humidity sensors, motion sensors and CO2 sensors. Select any of these options to be added on to your thermostat order. Valve Our durable series of brass-body zone valves are available as normally open or closed and in either 2-way or 3-way diverting configurations. Their long-life, low-noise, compact design and plenum rating, make this series of valves an ideal choice for almost any standard application.